November sees a joint tour – Inside the Delta – around the UK by two of the most entertaining blues and Americana artists you’re likely to see – New Yorker Guy Davis and Statesboro native, by way of Cambridge, England, Brooks Williams. The tour has already started and you can find details here or here. The two have played together before in the US but this is the first time they have properly collaborated, each taking turns to perform and then playing together at the end of the evening. These pair are great guitar players, singers and raconteurs – and reports already speak of outstanding shows. Not to be missed! You can catch our recent interview with Brooks Williams here. And watch out for Down at the Crossroads’ upcoming interview with Guy Davis who has some big news to announce – soon! 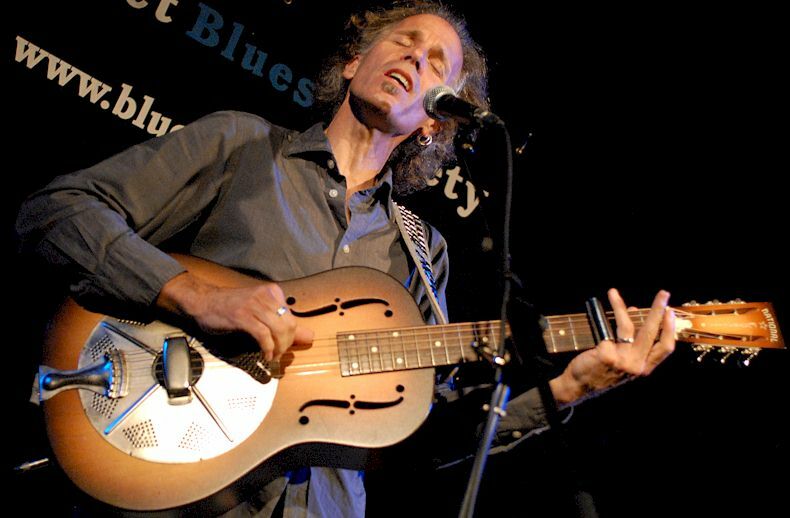 Brooks Williams has been described – rightly – as “one of the most consistently excellent musicians in roots music,” and his blues-infused Americana has been delighting audiences in the US and the UK for more than 25 years. Rolling Stone magazine once noted his “deft, tasteful guitar chops” – true, for sure, but if you get the chance to see Brooks Williams in concert, you’ll realize just how deft his guitar chops are. He’s a guitar master, guaranteed to make the jaws of any guitarists in the audience drop and to delight the rest. Brooks, hailing from Statesboro, Georgia, has lived in England these past few years and tours incessantly throughout the UK and the States. 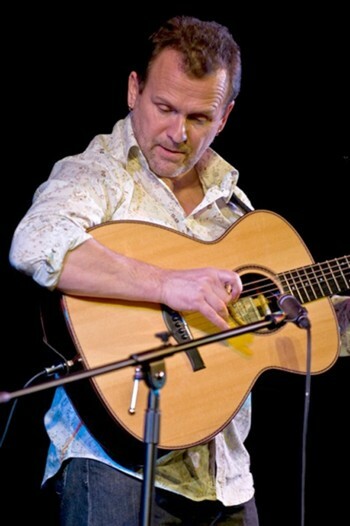 He has a back catalogue of nearly 30 albums to his credit and has just recently released a new album of blues numbers. He’s touring the UK this November along with New York blues maestro Guy Davis – a concert with these two will be quite a show, believe me – and the new release, in support of the tour, is simply entitled Brooks’ Blues. Down at the Crossroads caught up with Brooks just prior to the UK tour. DATC: Brooks, you’ve been living in England for a while now, and touring all over the UK. How have audiences here reacted to your music, in comparison with the US, and has your music changed or evolved since moving here? Brooks Williams: When I moved to England six years ago it felt a bit like I was starting my career all over again. On one level that can be stressful and humbling, but it has also been very liberating. I’ve found the UK audiences to be very switched on about American roots music. They know the movers and shakers. They know the songs. They have an understanding of the tradition. 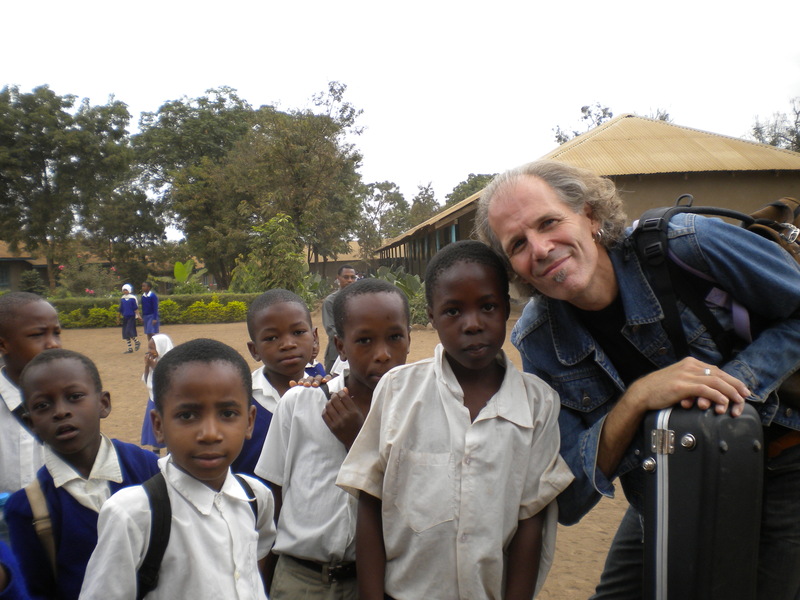 They spotted my connection to American roots music right away and have, literally, applauded the ways I have dug deeper into that tradition both in my writing and in my performing. It’s been like having a mirror held up to my face and being reminded what I look like. There’s a saying in music about performers and writers “finding their voice,” as if it is a one-time thing. I believe that finding one’s voice is an on-going process. Moving to the UK and playing for UK audiences has played a big part in that on-going process for me. DATC: But you’re still touring in the US as well? BW: I tour the US quite a few times every year. This upcoming year looks to be the busiest year yet. DATC: You’ve been very actively recording over the past few years and have just released a new album of blues songs, called Brook’s Blues, with twelve traditional blues numbers and none of your own songs. What was thinking behind this? BW: I’m doing a month-long UK tour called “Inside The Delta” with American bluesman Guy Davis in November 2016. We’ll each be doing our own sets but also backing each other up. In preparing a set of mostly blues songs for the tour I realized how many songs I know without even digging too deeply into my repertoire. And I realized how much I love these old songs. So in celebration of the “Inside The Delta” tour I recorded all 12 tracks over 3-days, “old school,” with vintage mics, a creaky chair, just my voice and guitar. DATC: It’s just you and your guitars on the album, Brooks – which puts your guitar work centre stage – always a pleasure! Tell us about the guitars you used on the album. BW: I used a Collings acoustic with a vintage DeArmond pickup (like Lightning Hopkins had in his acoustic guitar), a National Estralita resonator and my Chickenbone John 3-string cigar box guitar. The amp is a new Fender I borrowed from John Boden. In terms of tunings and slides, I used both glass and chrome slides, depending on the song, as well as a range of tunings from standard to drop-D to open-D to open-G.
DATC: The album kicks off with Robert Johnson’s From Four Until Late, which was famously done by Cream in the ‘60s. You give more than a nod to Robert Johnson in your version, but yours gives us something a bit more sophisticated maybe in the guitar work. How do you go about transforming a song that a lot of people will be familiar with, from the original, into your own interpretation? 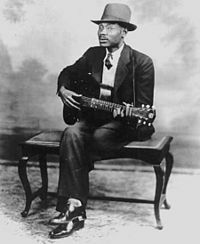 Particularly with someone like Robert Johnson, who’s a pretty nifty guitar player! 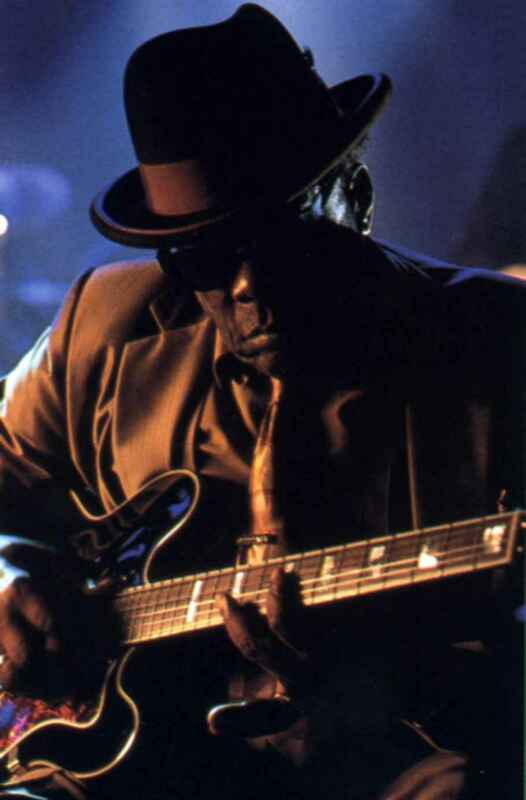 BW: It’s the way I have of transforming a well-known blues song to something else that inspired me to call the album “Brooks’ Blues.” These are the blues as I know ‘em. I’m not even aware that how I know the blues songs is that different to the original. And I don’t really know how I go about arranging the songs. It’s just something I’ve always been able to do. Blues songs are just like any other song to me and that means the lyrics are central. Each song has a story. But the extra beautiful thing about a blues lyric is that it leaves the backdoor of interpretation propped wide open while at the same time being exactly what it says it is. We can meet it wherever we happen to be. I’m more interested in singing the lyric than playing the guitar part as it is known on those great classic recordings, which I listen to and love so much. 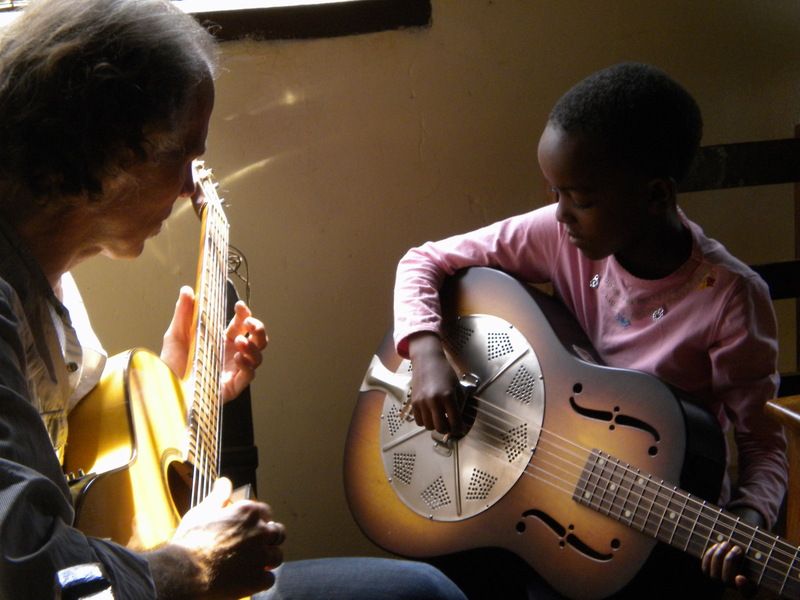 DATC: You’ve included a Bessie Smith song, Backwater Blues, which features some nice, dark resonator work. Very different from Bessie Smith’s original piano version and it works very well. There always seems to be much more attention given to the early men blues singers than the women – who actually in their day were the much bigger stars. Is there a mine of material there that we’re missing do you think? BW: Though there are some excellent exceptions – see Sister Rosetta Tharpe playing “Didn’t It Rain” for one! – the blues does seem to be more about the guitar slingers and the men slinging those guitars. However, as you say, that wasn’t always the case – and it shouldn’t be the case moving forward. Early blues was more about the singers and singers in those days were accompanied by a piano. The guitar came to the front later, which is great and has inspired me, but we can’t lose track of the roots of the roots, so to speak. There’s a whole bunch of music we’re missing and some very interesting and nuanced song lyrics waiting to be rediscovered. DATC: And of course, I suppose Statesboro being your home town, on this sort of album you had to include Statesboro Blues? I guess Willie McTell is an artist you admire? 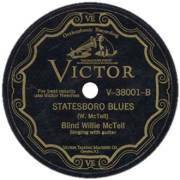 BW: I had to include Statesboro Blues. It practically says so on my birth certificate! For someone who loves guitar and the blues, what an incredible birthright I’ve been handed. 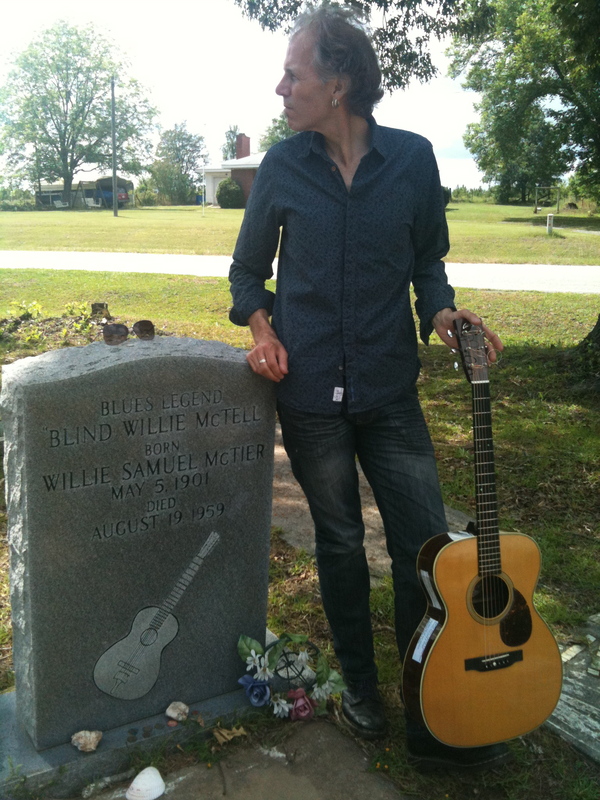 Willie McTell played a mean 12-string guitar and had a beautiful tenor voice. And he traveled the highways and byways of my home state. 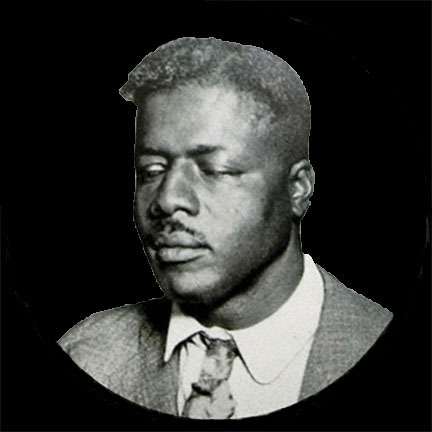 How he did that as a blind man of colour in the Deep South USA in the 1930s is beyond my scope of understanding. But what isn’t beyond my scope is the fact that all the early bluesmen were first and foremost entertainers. 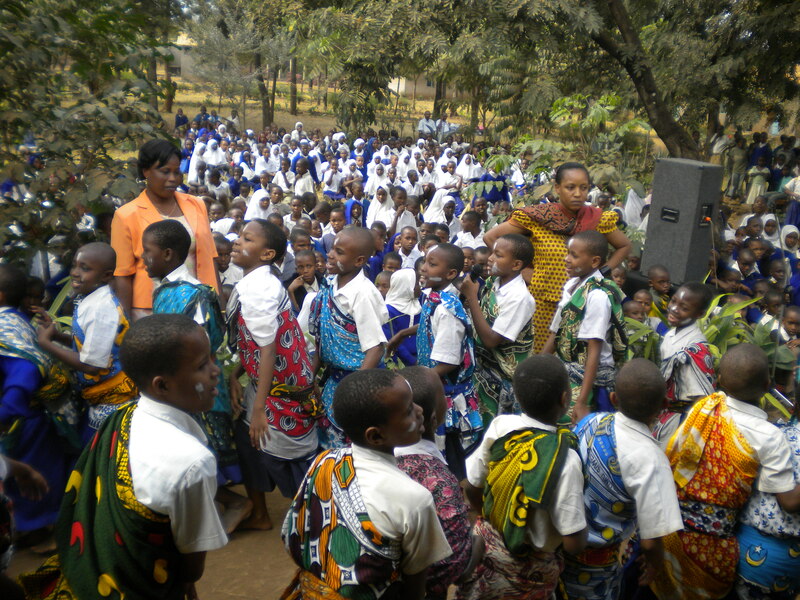 The music is for the people – the community – and it has a place in the community. As such I believe that the blues was just one aspect of their music. It’s the part that’s remained, for sure, but in order to make a living and to sing for and to the people, they had to entertain. That meant doing all kinds of songs – blues, gospel, ballads, show tunes, popular tunes, novelty tunes. My shows are not that dissimilar – nor is Brooks’ Blues – you need a bit of slide, some rock and roll, a gospel song, a ballad, maybe even a country-tinged song. DATC: The last song on the album is a Rev. Gary Davis song, I Will Do My Last Singing. Of all the Gary Davis songs, that’s an unusual one to choose, but it’s a lovely, lovely version of it – you’d hardly recognize it as a Gary Davis song. Tell us about that. BW: I was taught I Will Do My Last Singing by the delightful blues duo, Shari Kane and Dave Steele from Michigan USA. I had the great pleasure of doing a couple of tours with them last year. We closed every show with this number. Though I do it quite differently to them, and, obviously, quite different to Rev. Gary Davis’ version, I found the song quite evocative. A bittersweet sentiment that hints at hope. I play it with a slide on my acoustic guitar tuned to open-D.
DATC: Brooks, anyone who’s been to one of your concerts will know how great a guitarist you are. And you run guitar workshops from time to time and you provide tablature and chords for quite a few of your songs on your website. What’s the motivation behind that? BW: I am more aware than ever that we all need to do our part to see this music lives on in future generations. We all need to tend the fields, so to speak, and plant the seeds. New blues songs need to be written. The old blues songs have to preserved. My hope is that the more of us out there teaching the songs, directing people to both new and classic recordings, and getting people listening to the blues, the more people that will get as hooked on it as I am and will keep it going, either as players, presenters, customers. We need it all. In terms of the players, and why I do the workshops and put tab/chords/lyrics on my website, I’m hoping that maybe they will put their own spin on a Brooks Williams version of an old blues classic. Or maybe even put their own spin on a Brooks Williams song. This stuff isn’t mine, after all. I’m just a caretaker, like everyone else. DATC: And finally, Brooks, I know you’re a bit of a road warrior in terms of your touring. What’s on the agenda for the next few months? BW: More touring. Haha! No seriously. More touring. I’m just getting started and I feel like I’m just getting to the good stuff. We’ve got a big tour lined up in the New Year: a month is USA, six weeks in the UK, two weeks in Europe with my band, and on and on. Mine is not an overnight success story. I’ve been doing it too long for that to be the case, but every gig presents the opportunity for me to introduce my music to someone new. I’m winning over fans one at a time and that ain’t a bad thing! Check out Brooks’ website for news, albums, videos and guitar tab.